Abstract: In the area of Nowy Sacz the Lower Miocene, marine deposits (of the N 5, NN 2–3 biozones) have been discovered in the southern part of the Raca Subunit of the Magura Nappe. These deposits belong to the Zawada Fm., which probably overlaps the Malcov Fm. (Upper Eocene–Oligocene) with an erosional hiatus. These folded deposits are represented by medium- to thick-bedded glauconitic sandstones with intercalations of thick-bedded marls. Facies-lithological development of the Zawada Fm. displays features characteristic for the northern part of the Magura Basin (Siary facies zone). During the Early Burdigalian the partly folded Magura Nappe was flooded from the residual flysch basin located in the north. At that time the seaway connection between this basin and the Vienna Basin via the Orava area was probable established. Abstract: A model for the stratigraphic architecture of the Eocene strata of the Podhale Basin has been developed (Poland, Western Carpathians). Generally, the sedimentation of the basin was controlled by eustatic sea-level changes, and fore-arc spreading in a convergent regime related to the infratatric subduction. During the studied stratigraphic interval the former factor dominated the tectonics. Sedimentation took place during three distinct intervals (composite sequences), which are correlated with the Upper Lutetian/Lower Bartonian, the Middle/Upper Bartonian and the Lower/Upper Priabonian stages. The first two were studied in detail, the third was evaluated on the basis of published data. In the first composite sequence a TST was developed, in the second composite sequence we could distinguish LST, TST, HST and SMST’s. Surprisingly, a mass-occurrence of heterosteginids occurred during temperate conditions and higher trophic levels in the SMST. In contrast, a lower trophic level and warmer conditions are indicated in the third composite sequence by Nummulites fabianii. Our sequence-stratigraphic data correlate well with the corresponding implications from a recently published composite oxygen isotope record for the Cenozoic. Abstract: The terrigenous material of the flysch of the Pelagonian zone s.l. of the Internal Hellenides in Pelion, Skopelos, Euboea, Othrys Mountain and Argolis have been characterized by their heavy mineral assemblages, based on 114 samples. The terrigenous input can be divided into a garnet-dominated association, restricted to flysch sediments of both western Othrys and Ligourion (Argolis), and assemblages with variable amounts of the stable ZTR group (zircon, tourmaline, rutile) and apatite, found at all the other localities. The garnet assemblage is assumed to have been derived from mica schist complexes existing at the western margin of the Pelagonian microcontinent, tectonically active due to the closure of the Pindos Ocean. The situation is similar to that already known from the Pindos and Parnassos-Ghiona zones. Blue amphiboles detected in western Othrys witness the existence of blueschist terrains. The ZTR-apatite group points to a different source province, not connected regionally with the former source. The activity of this source terrain can be related to the closure of a Neotethyan ocean in the Vardar zone, along the eastern margin of the Pelagonian unit, during the early Tertiary. The heavy mineral assemblages indicate that in this source area ophiolitic complexes are tectonically incorporated to a lesser extent. Blueschists seem to be absent, as no detrital blue amphibole was found. Abstract: On the basis of surface exposures and core sections, a comprehensive sequence analysis of the Triassic series was carried out in the Transdanubian Range. For recognition of the sequences as well as their boundaries, the regional subaerial exposure horizons, the maximum flooding intervals, the transgressive–regressive trends, the platform progradations and backsteppings, as well as signals of the higher order accommodation changes were primarily considered. Detailed analyses were accomplished in six selected sub-regions. On the basis of the results of these analyses, a composite sequence chart was compiled. The Triassic history of the Transdanubian Range can be subdivided into four stages. Within the first stage (Induan to Middle Anisian) which can be characterized by a ramp setting, five sequences have been recognized. The second stage (Middle Anisian–Ladinian) is mainly controlled by the Neotethys rifting and can be subdivided into three sequences. Infilling of the previously formed basins took place during the third stage (Carnian), consisting of three sequences. The fourth stage (latest Carnian to Rhaetian) reflects the passive margin evolution of the Neotethys. However, a new rifting (Ligurian–Penninic) began in the Late Norian and also influenced the evolution of the Transdanubian Range. Four sequences were recognized in this final evolutionary stage. About 50 % of the recognized sequence boundaries could be correlated with those reported from the Southern and Northern Alps, from the German Basin, and from Western Canada. Abstract: Combined Sr-Nd isotopic study of the Hercynian granitoid rocks from the Western Carpathians has been carried out on whole rock (WR) samples from typical representatives of each granitic body in the Carpathians. The results presented here reveal the dominance of heterogeneous crustal sources for the majority of the studied granitic rocks, which have a neodymium crustal index NCI = 0.4–1 (majority 0.6–0.8). Initial isotopic data 87Sr/86Sr(350) = 0.7053–0.7078 (ΕSr(350) = 16.7-52.6) and ΕNd(350) = -0.6 to -6.9 preclude a simple mantle and/or crustal origin for most of the West-Carpathian granites and suggest more complex sources, such as an enriched source in the subcontinental lithosphere, or amphibolitic lower crust, with crustal-sedimentary addition. We cannot exclude, from the presented data, a hypothetical depleted mantle source, at least as heat flux during crustal anatexis processes. Apparent crustal residence ages, indicated by Nd model age — t(DM2st) = 1.1 ~ 1.6 Ga, are comparable with other segments of the European Hercynian belt. Petrographically, these granites are representative of common crustal anatectic rocks with magmatic muscovite, however, their isotopic signature reflects an I-type granitic character, usually related to subduction processes at active continental margins. 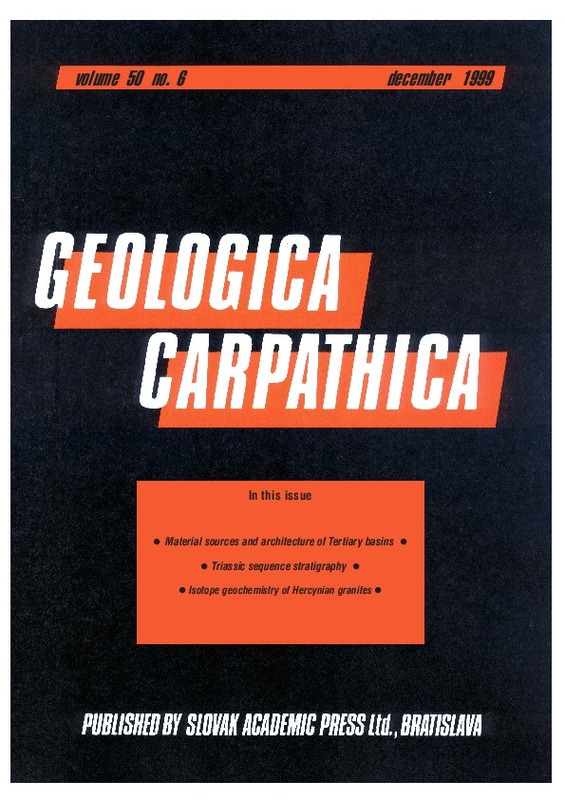 Recent metamorphic, sedimentary and/or structural knowledge from the Hercynian basement of the Western Carpathians suggests a continental collisional, rather than a volcanic arc setting. The West-Carpathian granitic rocks were generated by partial melting of mainly crustal Proterozoic material during subduction-collisional processes of the Hercynian orogeny.